24+ Seeds. 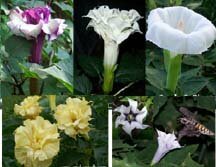 A mix of the three most popular Datura''s with fragrant, large, double/triple blooms. These flowers are stunning as well as fragrant, certain to impress - some of my all-time favorites! seeds PLUS planting instructions, including a color photo for seedling id. These seeds are MIXED, they are not separate packs. 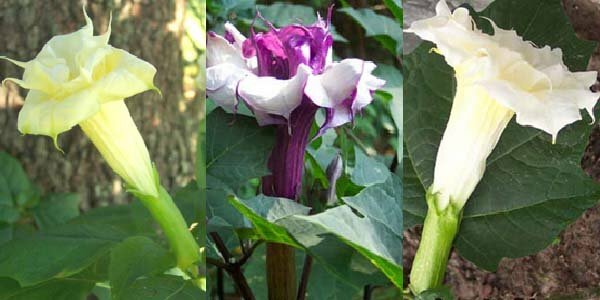 These are very fragrant Datura's (Devil's Trumpet, Horn of Plenty, sometimes called 'Angel's Trumpets') and each variety has at least double and often TRIPLE blooms! The 6-8 blooms face upward from the bush which reaches 3 feet. If the flowers weren't enough, the double purple plants also sport glossy, dark purple stems. Datura is a perennial in zones 9 and up and usually live about 4 or 5 years under good conditions. Treat as a fast growing, self-sowing annual in other areas. Datura?s produce several seed pods and thrive in high heat, particularly in humid areas. They are very rapid growing plants in full sun or partial shade and, in my experience, bloom about 90 days after planting. Datura?s can be started in pots or directly in the garden after last frost they also make a wonderful container plant on patios or decks. They are easy to transplant when small, but more difficult once established in the garden. Just wanted to drop you a note now that summer is over, (In Michigan, anyway), to let you know how thrilled we were with the triple ruffled Datura I bought from you. They were gorgeous!! Dozens of blooms, and darn near everyone that saw them got jealous, (Music to a gardener's ears). Thank you so much!